SUPERMAN & BATMAN: Setting Back to Back World Records!!! Setting Back to Back World Records!!! This has been an amazing week in the world of collectible comic books and The Batman ended up beating Superman!!! 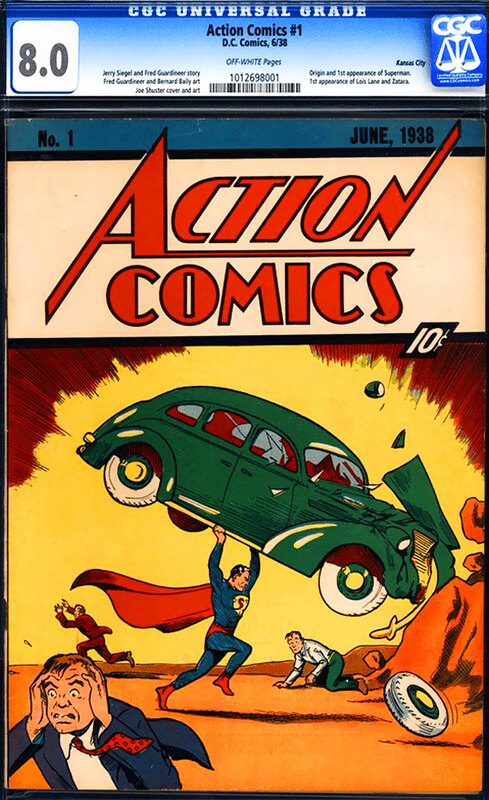 Last week, ComicConnect.com set an all-time auction record of $1 Million when it auctioned what is considered to be by many, the Holy Grail of comics, a 1938 edition of Action Comics Superman that originally sold for just 10 cents. Previously the record for a comic book paid at auction was the same Number 1, Superman but in a grade 3.0 which sold for $317,000. 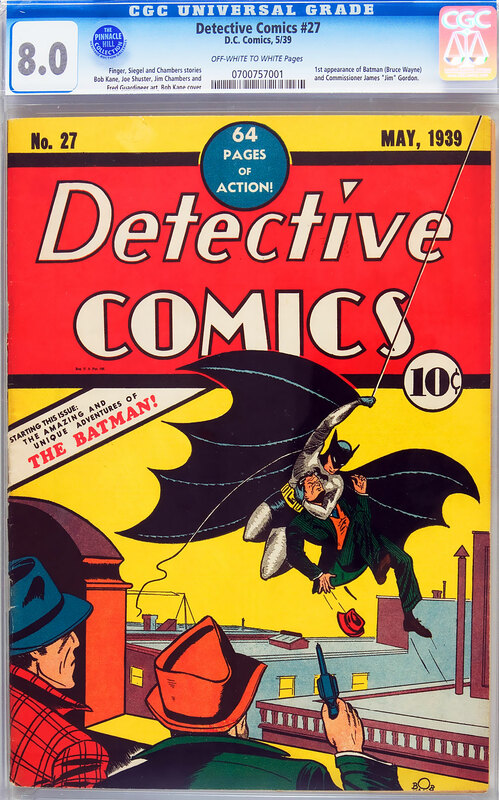 Just yesterday, Heritage Auctions set a new all-time record when they sold a number 27 Batman Comic from May of 1939 which was the very first Batman comic ever printed. 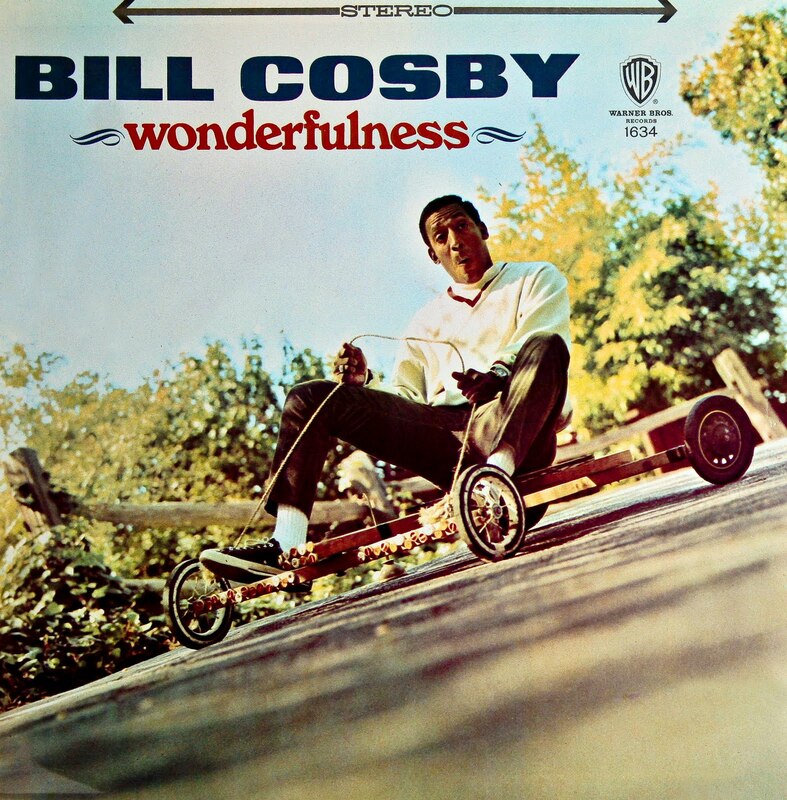 This ultra-rare issue is in very good condition. The collector who put this ultra-rare comic up for sale purchased in more than 40 years ago for $100!!! It's very interesting (as T. Walker Lloyd would say) that the comic book world and collectible coin and collectible stamp worlds have unbiased third party grading companies but vintage Rolex watches do not. Actually a friend of mine has mentioned to me several times, he believes the vintage Rolex world needs such a grading standard, and I agree. It is likely this is the last generation of petroleum cars and that within 10 short years, all new cars will run on electricity. In some ways this is like mechanical watches v. quartz, the only difference is that mechanical watches are not terrible for the environment. In this head to head competition, Motor Trend put the 2010 Tesla against the 2011 Porsche Boxster Spyder and it is fascinating!!! 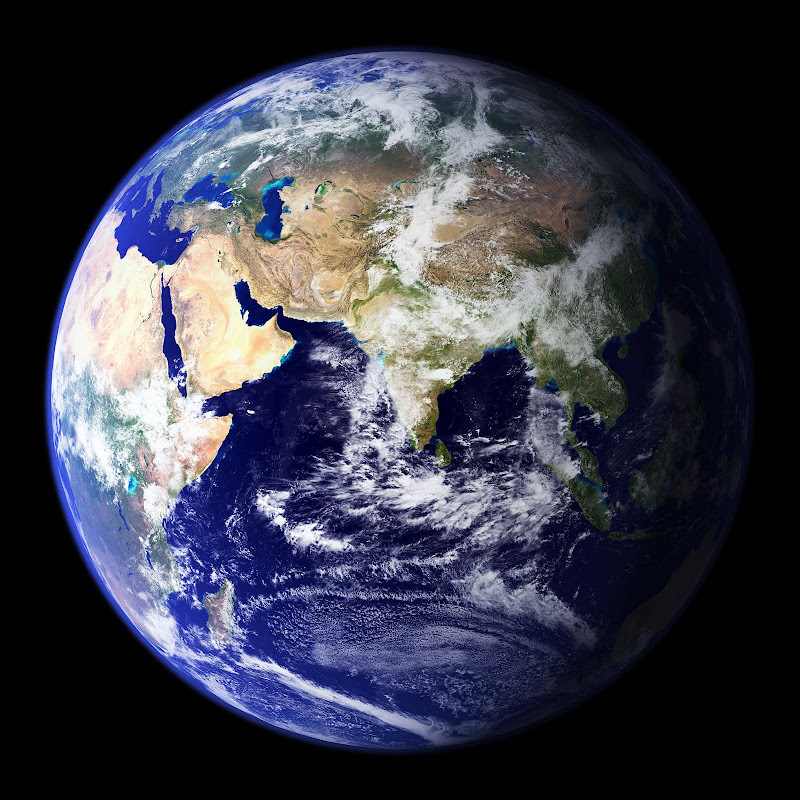 These amazing new images of earth from NASA are mind-boggling and they make great desktop wallpaper. 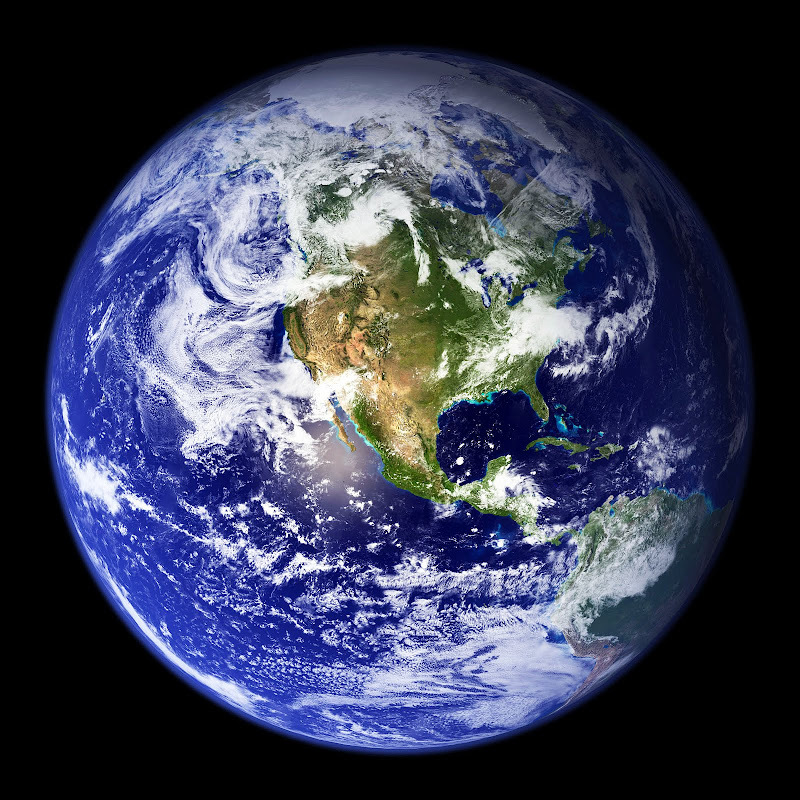 For the high-resolution versions, click on each image, then right-mouse-click on the image and save it to your computer. There is something Willie Wonka In The Chocolate Factoryish about this image. I don't know exactly what it is, but it puts a smile on my face!!! Now I have to go eat some chocolate!!! 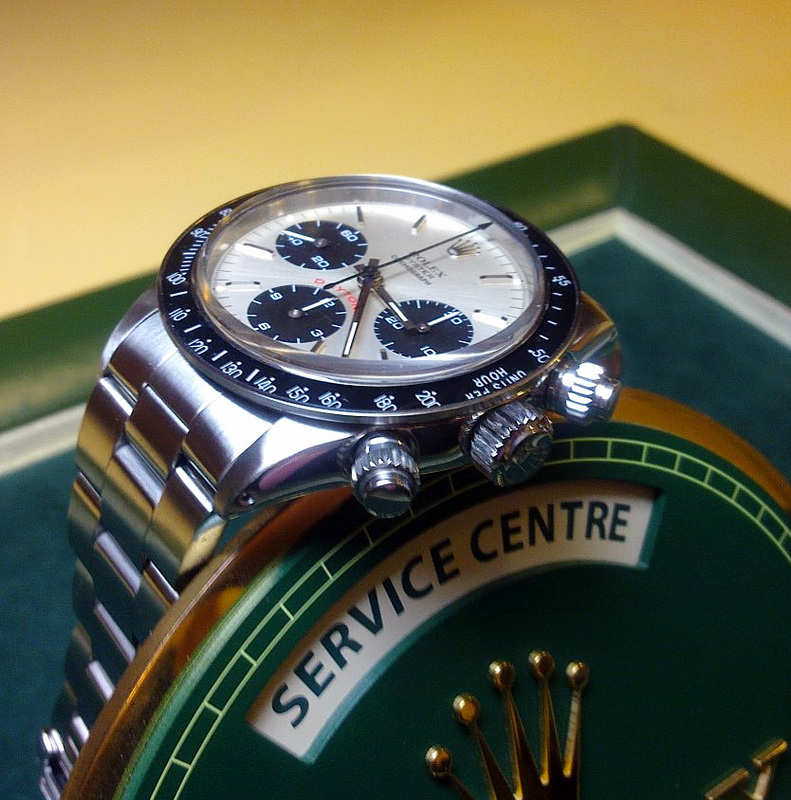 1957 was a very good year for Rolex. 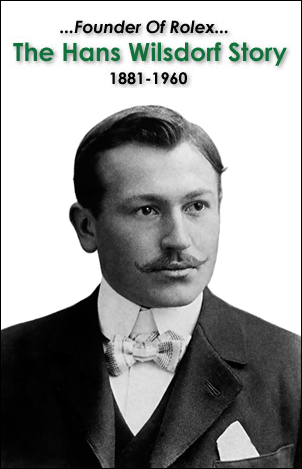 Hans Wildorf, the man who founded Rolex in London, England in 1908 had realized his dream and in three short years (in 1960) he would exit the stage of life. 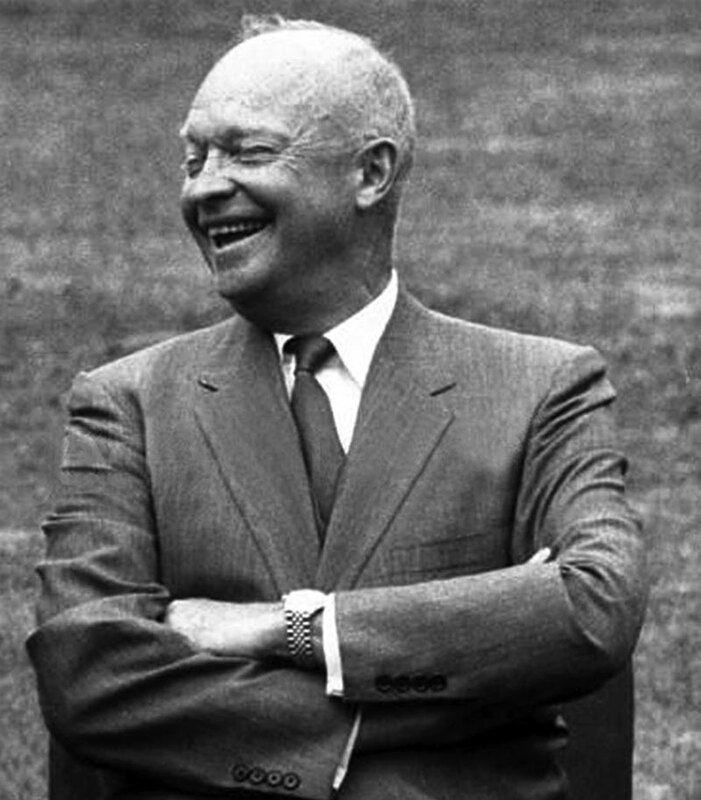 In 1957 Dwight Eisenhower was the President Of The United States and as the leader of the free world, he wore a yellow-gold Rolex Datejust on his wrist. President Eisenhower was not on the president of the United States, but for many, many people in Europe he was their savior since he brought over over the largest armada ever assembled in world-history and free all of Europe from Nazi aggression. Prior to World War II, Rolex had prospered and grown with amazing innovation and had built up a world-wide distribution system second to none. Hitler and his Nazi regime brought Rolex to almost a complete stand-still. 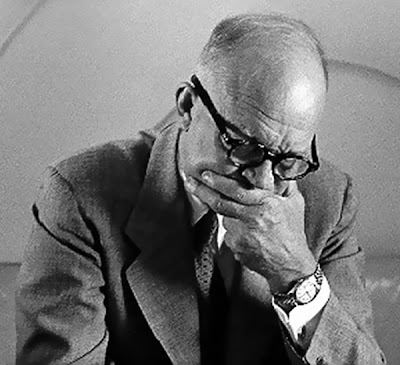 Rolex promised President Eisenhower they would not use the fact that he wore a Rolex for marketing purposes and they more-or-less kept their promise, but they definitely used his likeness subliminally. 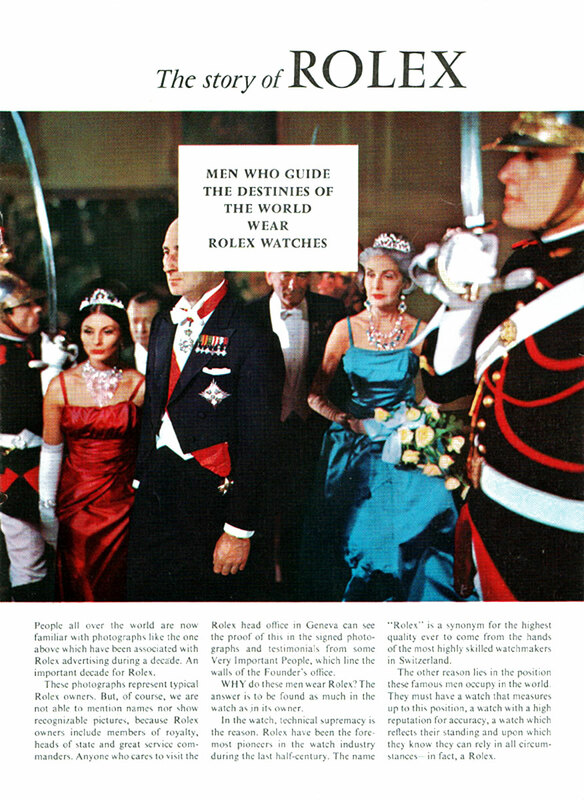 For instance look at the bald man in the ad above who's face is masked behind the ribbon that reads "Men Who Guide The Destinies Of The World Wear Rolex Watches." Notice the plaque in-front of the faceless man reads "ETATS–UNIS" which is French for "United States." 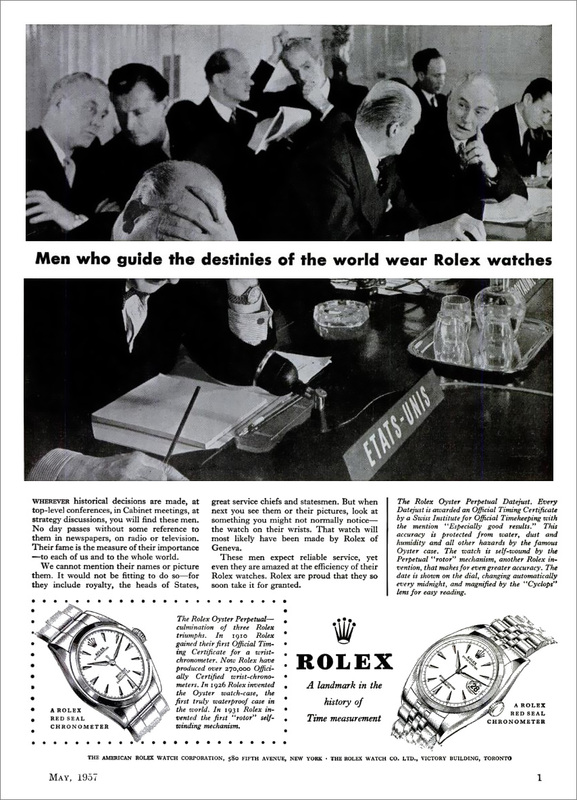 I don't know exactly what Rolex was thinking in 1957 when they ran these ads. 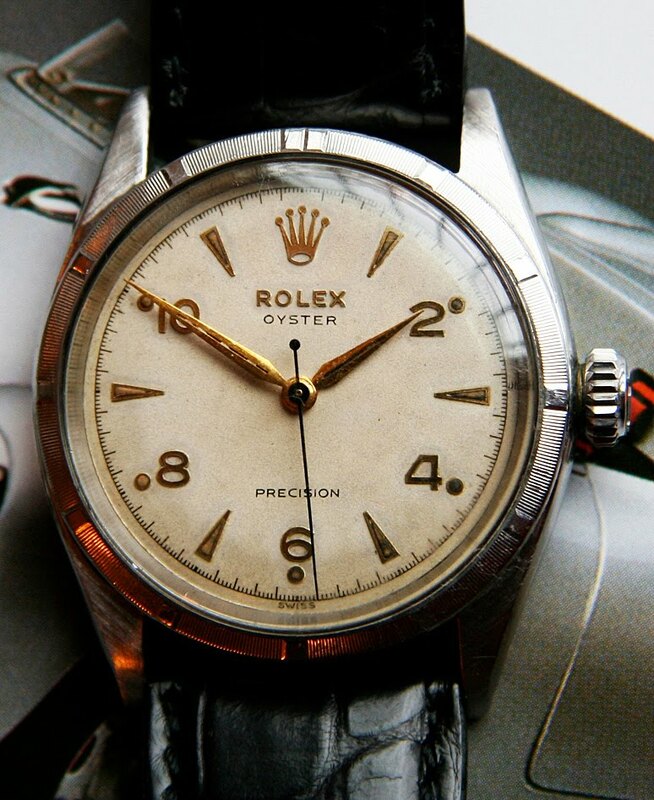 I think it is safe to assume that on the one hand they were extremely excited to have President Eisenhower wearing and relying on his beloved Rolex Datejust, and on the other hand they were probably a little frustrated because they probably wanted to point out this fact to everybody, but really couldn't. So they kind of did it subliminally–at least that is my best guess. 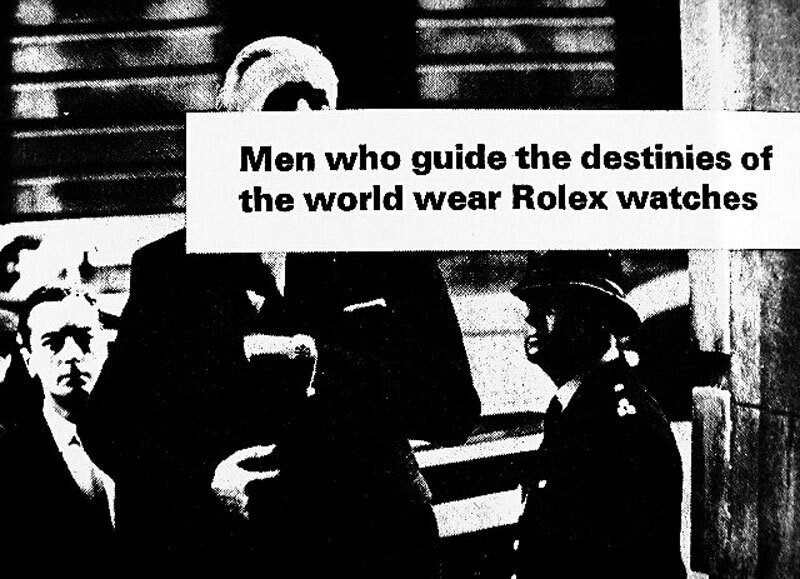 Next we have the following Rolex ad from 1957 which is clearly referring to Lord Mountbatten who is pictured in the photo below the Rolex ad. The photo of Lord Louis Mountbatten below was taken during World War II, and he is wearing his trademark Rolex Oyster Perpetual on a leather strap. Lord Mountbatten is Prince Philip's uncle. Prince Philip is married to Queen Elizabeth of Great Britain. 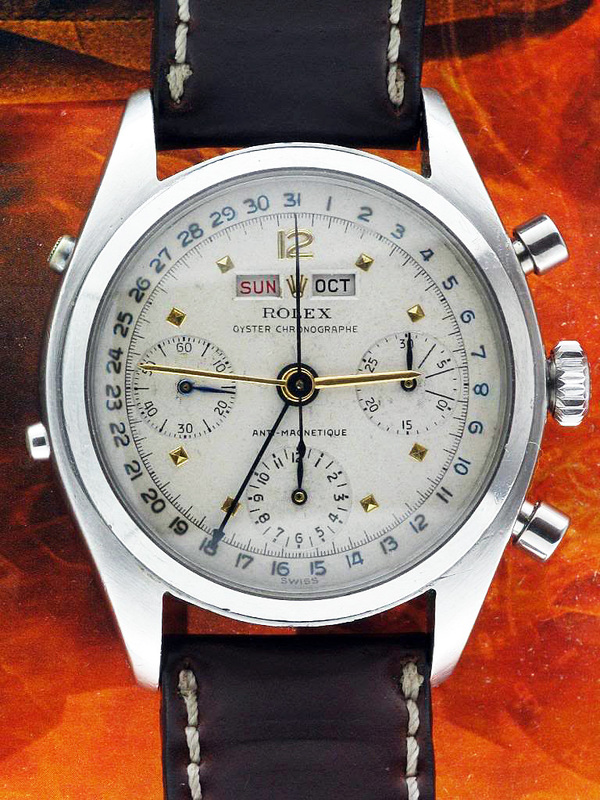 Christie's (London) auctioned Lord Mountbatten's Rolex in 2006 as seen below. It was an Rolex Oyster Perpetual Bubbleback [Reference 2940] that was made in 1940. 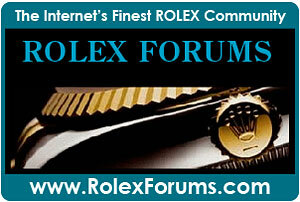 Its matt silvered dial was singed Rolex Oyster Perpertual, Officially Certified Chronometer. 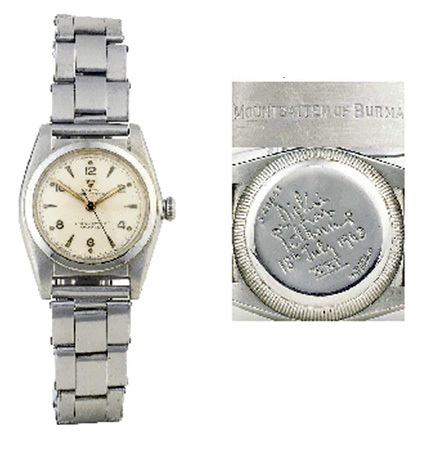 The Rolex was a gift from his wife and on the back the engraving reads: "Dickie from Edwina, 18th July 1943 XXI." The clasp is inscribed Mountbatten of Burma. Formerly the property of Earl Mountbatten of Burma (1900-1979), K.G., G.C.B, G.C.S.I., G.C.L.E, G.C.V.O., First Sealord of the Fleet and last Viceroy of India. A Gift from Countess Mountbatten to her husband on their 21st wedding anniversary. Louis Mountbatten was born Louis of Battenberg at Windsor Castle on 25th June 1900. His mother was Princess Victoria of Hesse, granddaughter of Queen Victoria and his father was Prince Louis of Battenberg. During World War I, together with the rest of the Royal Family, it was decided that it would be wise if German family names were changed. In line with this, the house of Battenberg became Mountbatten in 1917. In 1922 Louis Mountbatten married The Hon. Edwina Ashley. 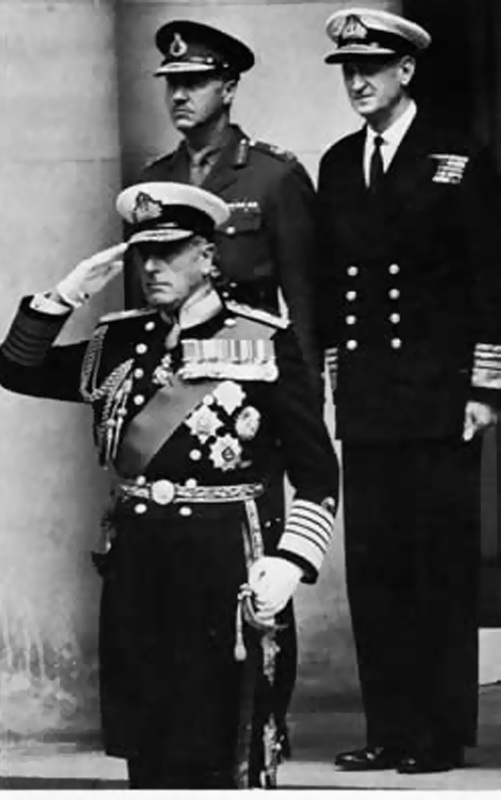 Earl Mountbatten had a long and very distinguished Naval career, by 1932 he was promoted to Commander and in 1937 to Captain. During World War II he was in command of H.M.S. Kelly and the Fifth Destroyer Flotilla and then H.M.S. Illustrious in 1941. In 1943 he was appointed Supreme Allied Commander of South-East Asia with rank of acting Admiral until 1946. 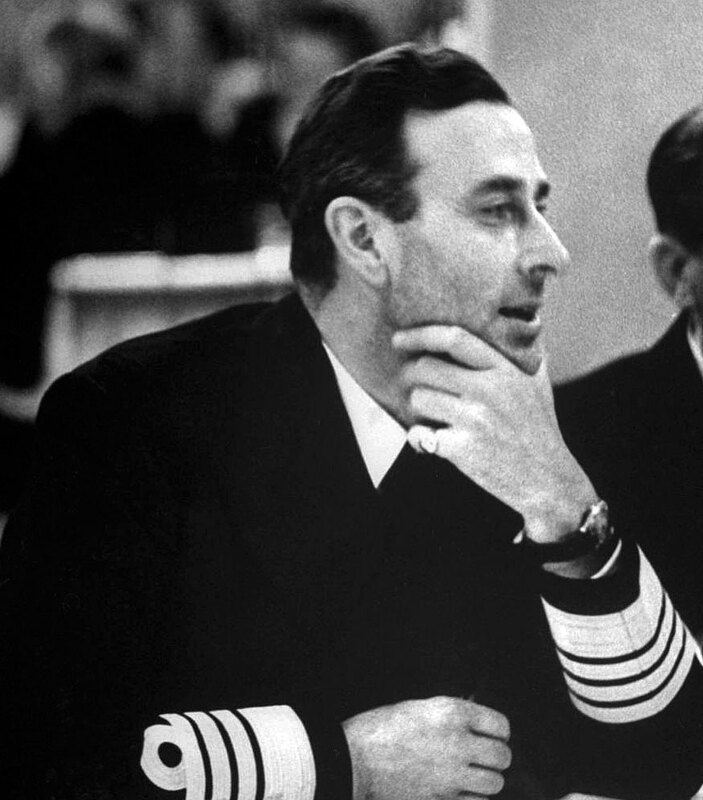 Between 1946 and 1956 he was promoted to Rear-Admiral, Vice Admiral, Fourth Sea Lord, First Sea Lord and Admiral of the Fleet. 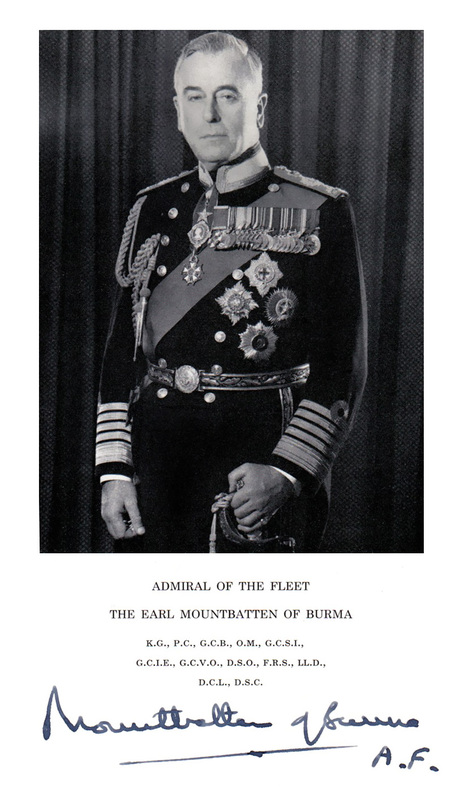 In 1947 he had been created 1st Earl Mountbatten of Burma and in the same year was appointed Viceroy of India. He was the last person to hold the position of Viceroy and concluded negotiations for the independence of India and Pakistan from the Empire. 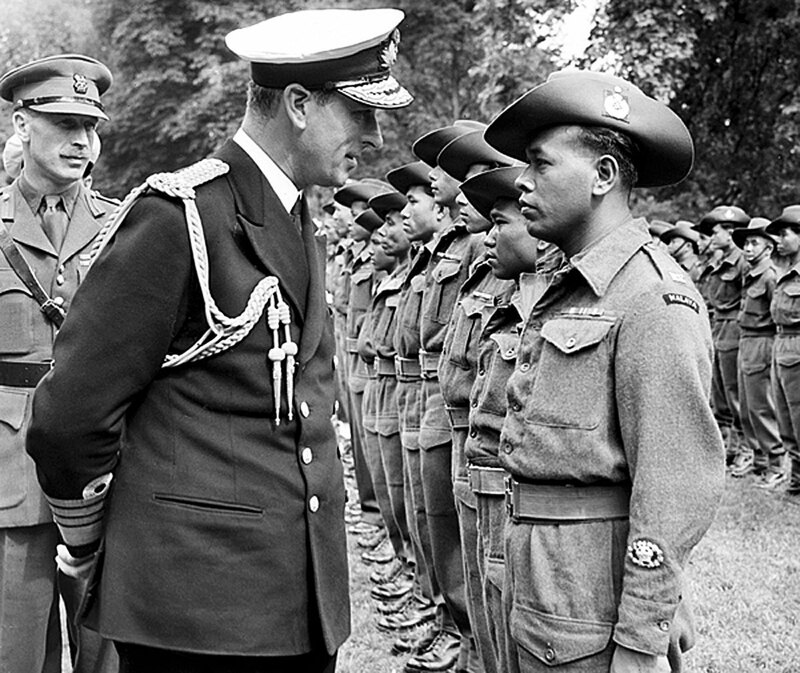 From 1959-65 as Chief of the Defence Staff and Chairman of the Chiefs of Staff Committee he worked to integrate various branches of the armed forces. Earl Mountbatten was the uncle of HRH Prince Philip, Duke of Edinburgh and was always known by the family as uncle Dickie. He was very close to HRH The Prince of Wales and in fact it is said that Prince Charles referred to him as his "honourary grandfather". It was whilst fishing in a small boat in Donegal Bay, Ireland on 27th August 1979 that Earl Mountbatten was murdered by the IRA. I am not 100% certain, but in this next ad I believe it is referring to David Sarnoff, the founder of NBC who was a maverick in Television Programming. 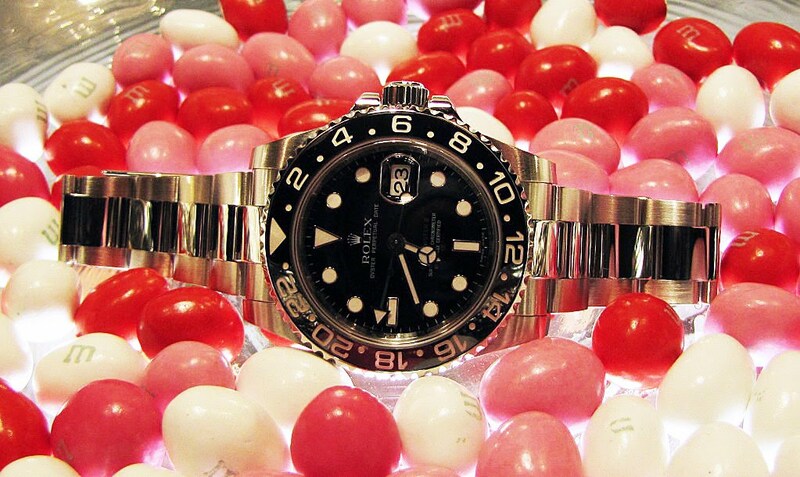 Rolex BaselWorld 2010 Predictions: The Return Of The RED SUBMARINER? The Return Of The RED SUBMARINER? 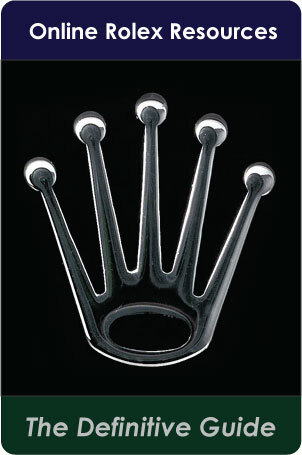 Only Rolex knows what they are going to be introducing in less than a month at BaselWorld in Basel, Switzerland. 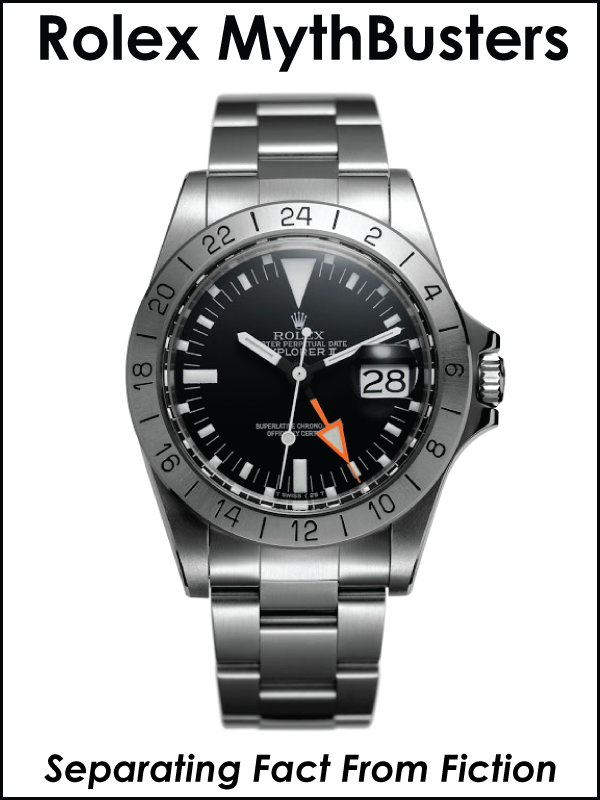 I believe it is likely they will be introducing the all-new stainless steel Rolex Super-case Submariner with Maxi-Markers and fat hands. 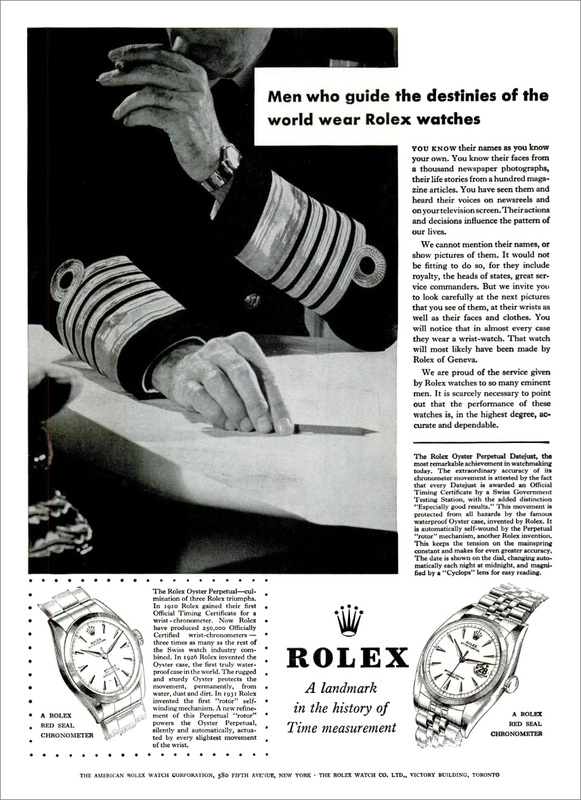 I hope Rolex has the wisdom and design prowess to bring it back as a Red Submariner. When I say "Red Submariner" I mean I hope they put a red SUBMARINER designation on the dial as you see in the image I created below. 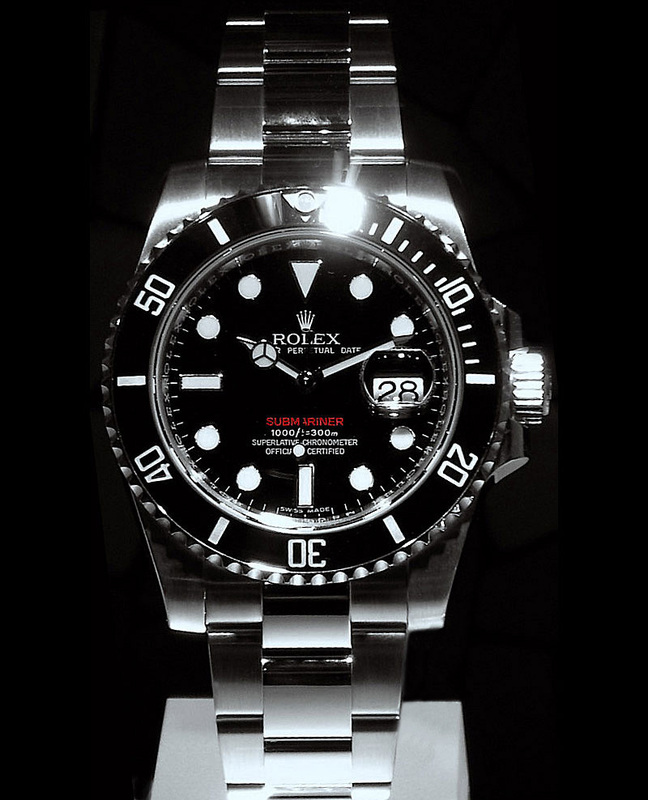 I think the classic black Rolex Submariner looks a million times better with the touch of red on the dial. I think it looks boring in all white. Black and white is too cold and sterile and reminds me of black and white TVs. The stainless Submariner needs a touch of color. The red, white and black color combination has always been unbeatable. 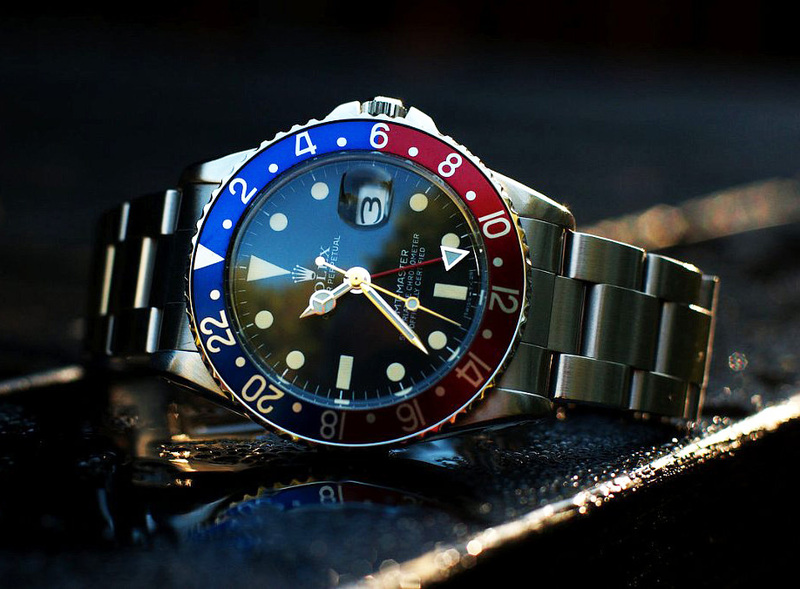 If Rolex does not bring back the Red Submariner, I am going to buy one and have the Submariner designation painted over in red, because I have to have this watch!!! 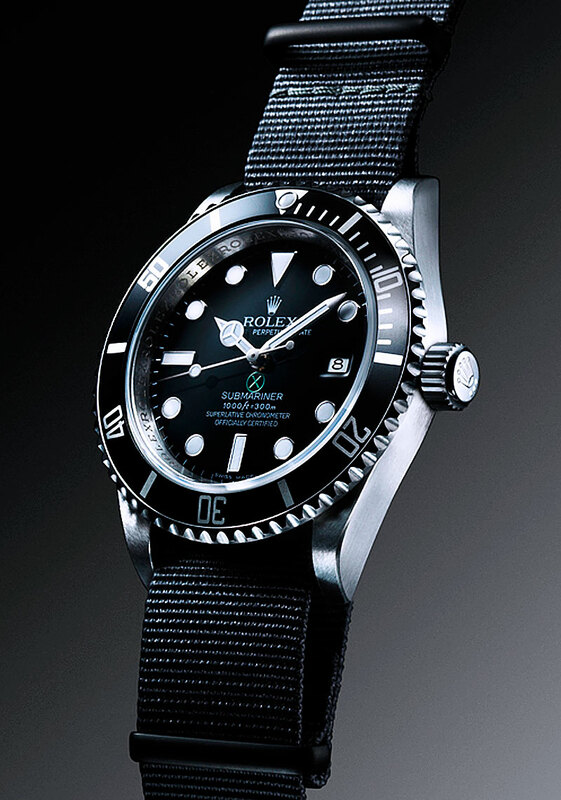 Of course Rolex has made different Rolex Submariner models in the past with the red Submariner designation, and the last production model was the Reference 1680 which was produced from 1967 to 1976. 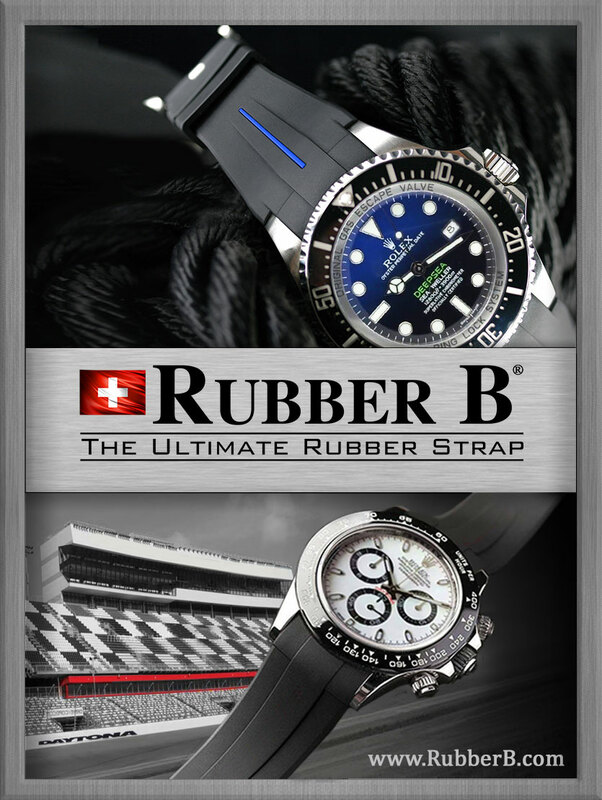 Soon I will show off my other idea for what I think Rolex will hopefully introduce this year at BaselWorld. If you are not familiar with BaselWorld, it is the most significant watch-industry trade-show, held once a year in Basel, Switzerland. 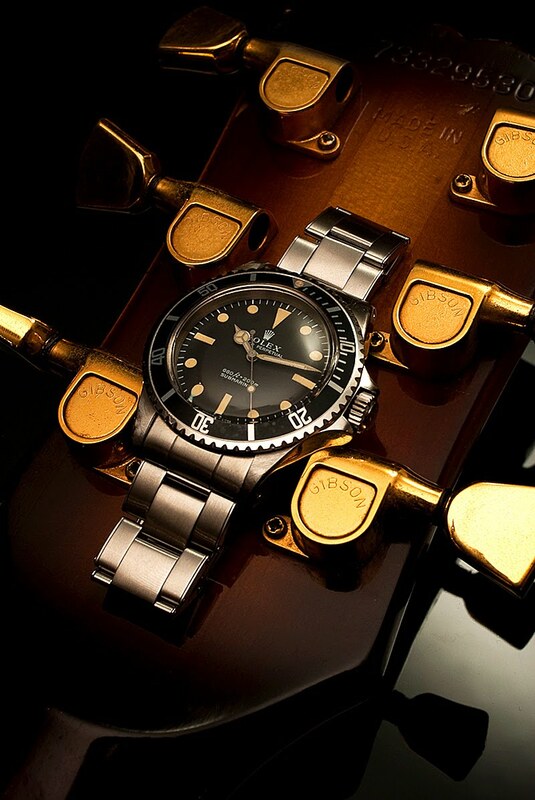 Rolex first introduced the Rolex Submariner in 1954 at the Basel show. On a side note, I could not help but notice how absolutely timeless Rolex design evolution is. 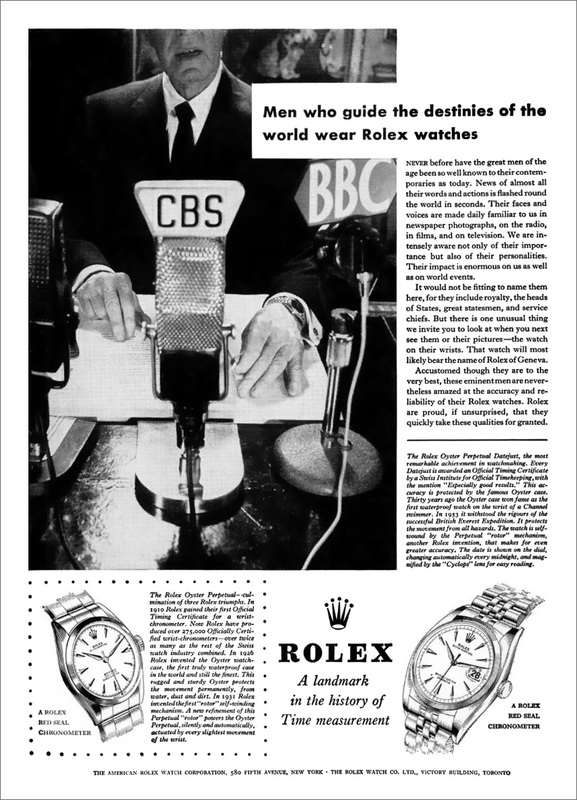 In particular, it blows my mind how true the statement is in the story below this one from 1974 that says "In an age of obsolescence and gimmickry, the simple classic virtue of a Rolex is indeed a rarity." 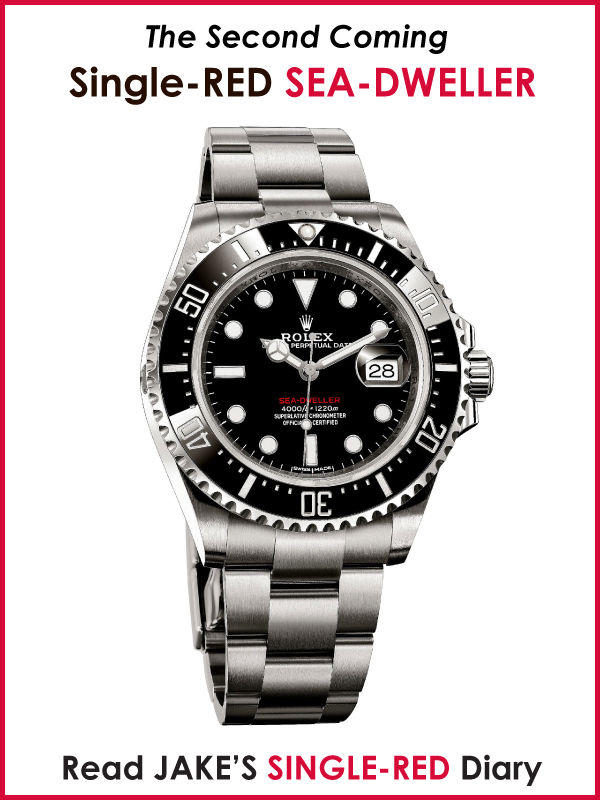 I could not help but notice how similar the Submariner from 1974 is to the one pictured above. 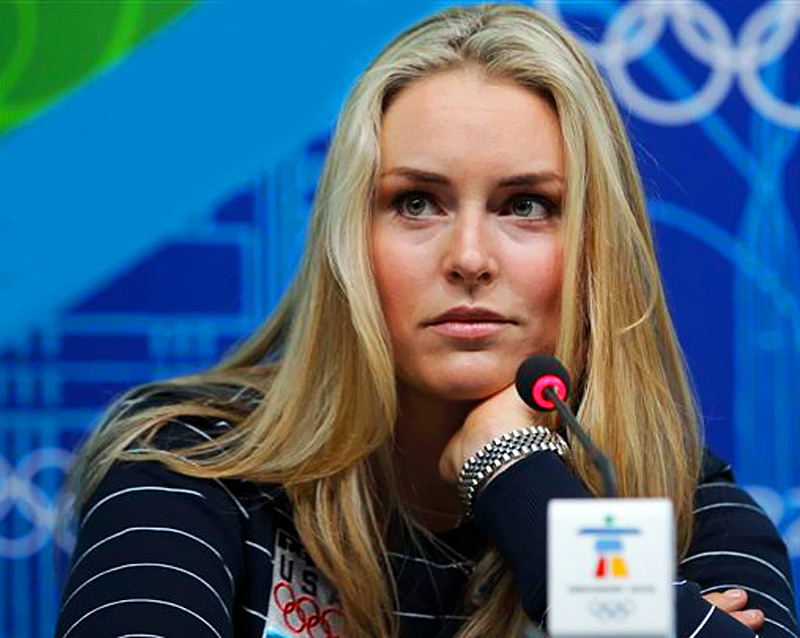 Lindsey Vonn took first place and won the women's Downhill Olympics Gold Medal in Whistler, British Columbia at the 2010 winter olympics. 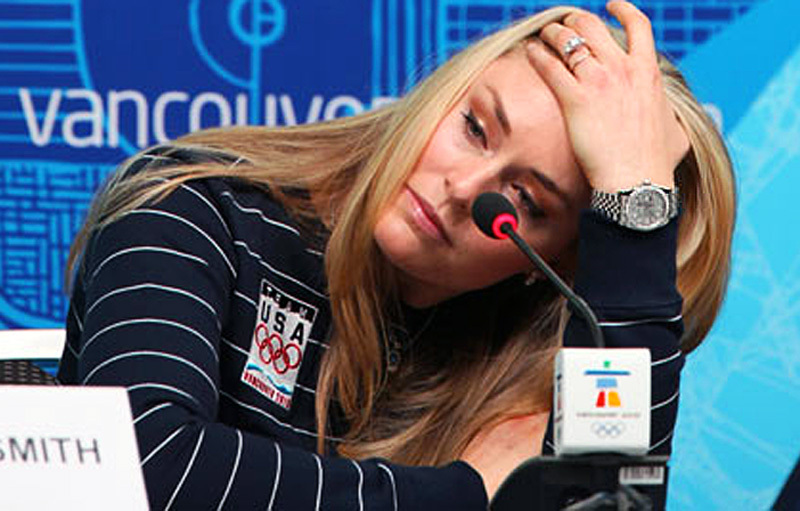 At age 9, Lindsey Vonn met Olympic downhill silver medalist, Picabo Street in a Minnesota ski shop and at that moment she decided she wanted to be just like her one day, but Vonn achieved even more. Yesterday, Vonn became the first American women to win a gold medal in the Olympic downhill. The fact she won is even more impressive when you realize she was suffering from a very painful recent accident that seriously injured her shin. Lindsey is pictured above and below sporting her stainless steel Rolex Datejust on a Super Jubilee bracelet. 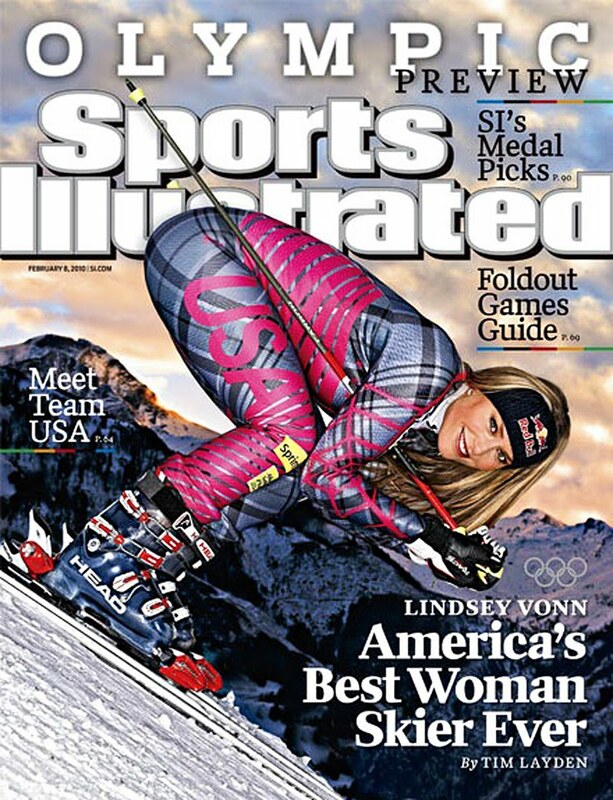 Lindsey Vonn is pictured below on the cover of the Sports Illustrated Olympics Special Cover. In the next 3 pictured from Sports Illustrated, we see Lindsey Vonn posing for a bikini photo shoot in Sports Illustrated. Oh Behave!!!! As I mentioned in the story above, Lindsey Vonn's role-model was American Olympic medal winner, Picabo Street who is featured in the vintage Rolex ad below. Picabo won a gold medal in the 1998 Winter Olympics in Nagano, and a silver medal in the 1994 Winter Olympics in Lillehammer. She also won 3 World Championship medals in her amazing career. 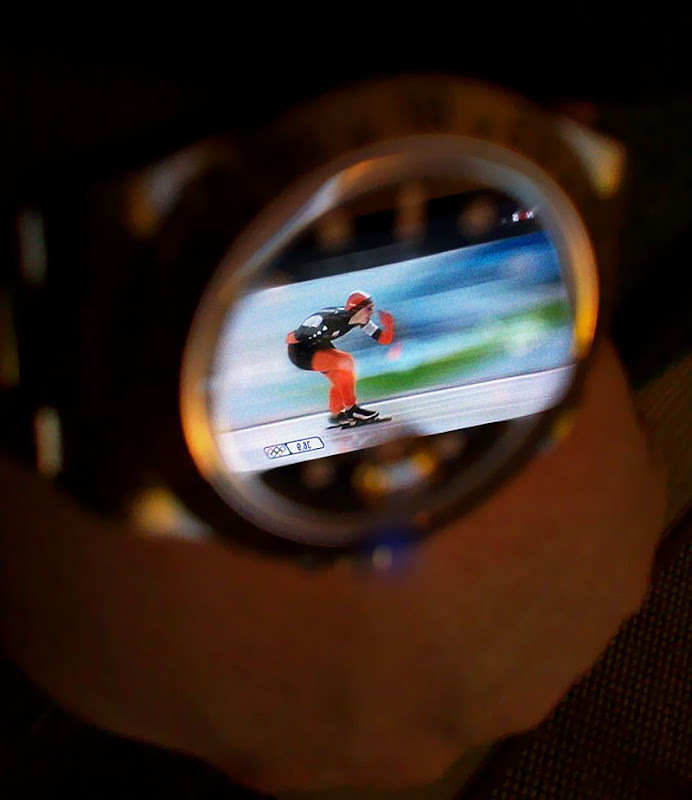 Skippy from Holland took this great wrist-shot while watching the women's speed-skating 3000 Meters Event of the 2010 Winter Olympics currently being held in Vancouver, Canada. This is just insane air!!!!!!!!!! 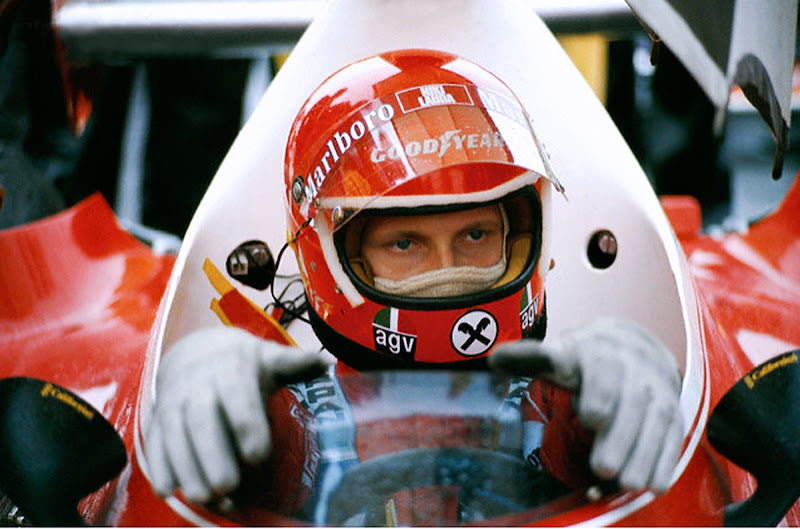 Niki Lauda's Formula 1 racing career has seen the highest highs and the lowest lows. His story is an amazing example of great achievement in the eye of diversity. 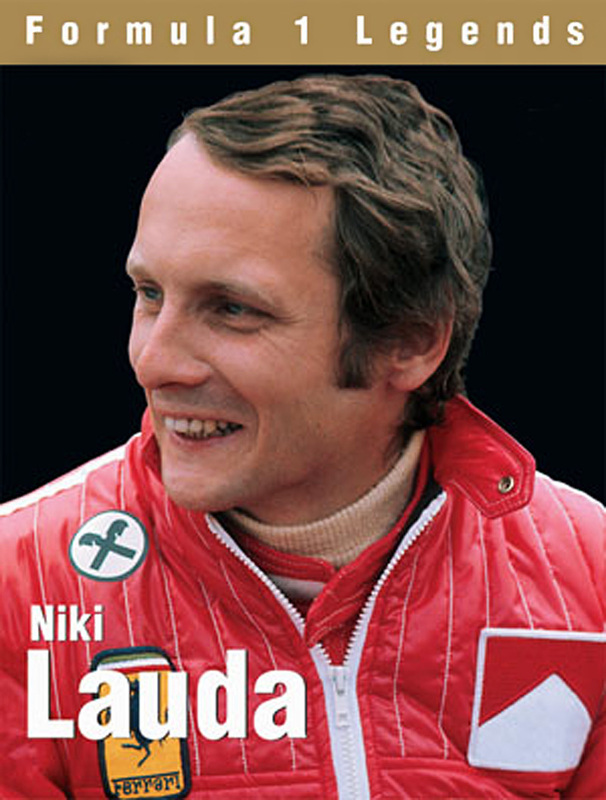 Niki was born Andreas Nikolaus "Niki" Lauda on February 22, 1949 in Vienna, Austria. 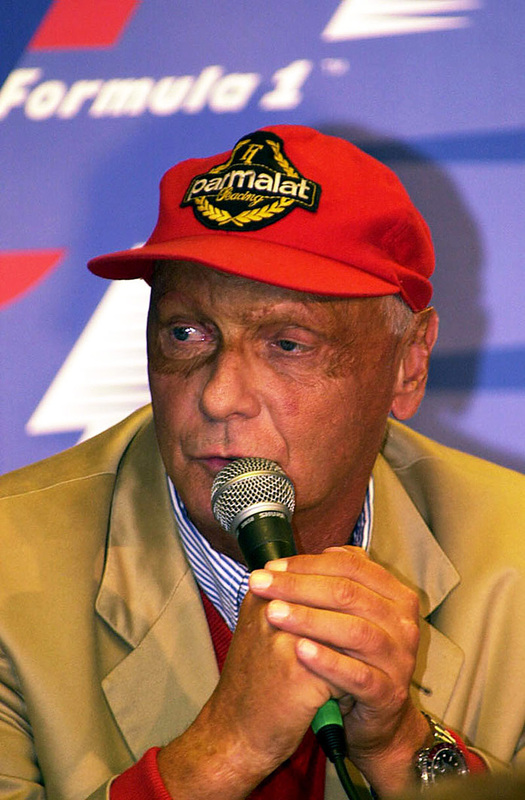 Niki Lauda's career racing achievement is amazing as he has won the F1 World Championship three times. Niki Lauda raced for the Ferrari team from 1974 to 1977. 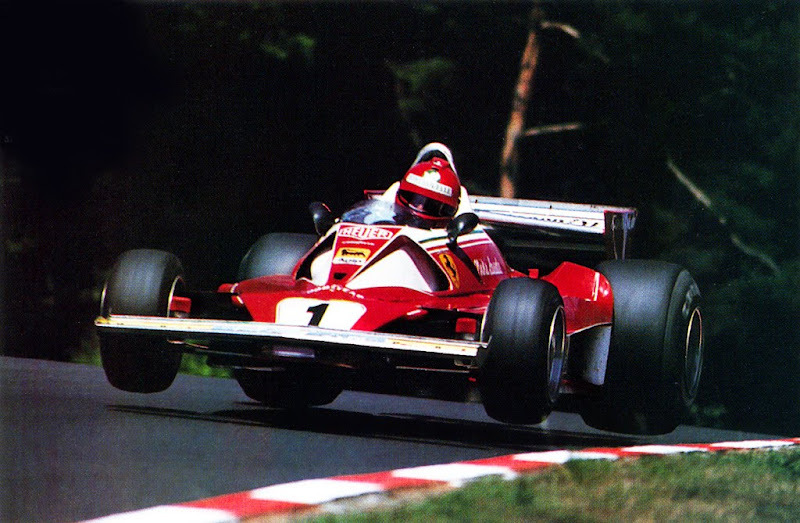 In 1976, a week prior to the German Grand Prix held at the treacherous Nurburgring Nordschleife track, Niki Lauda attempted to boycott the race due in large part to the lack of safety considerations and most of the other drives voted against Lauda, so the race was held. In a bizarre twist of fate, Lauda's Ferrari swerved off the track because its rear suspension failed and his car hit an embankment and burst into flames, trapping Lauda in his car. 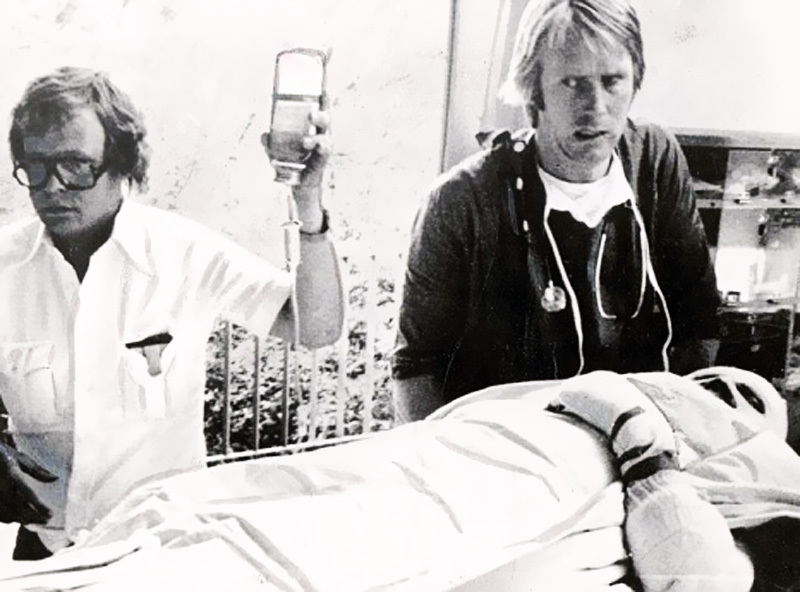 Before Lauda could be pulled out of his car, he suffered severe burns and inhaled highly toxic fumes which severly damaged his lungs and blood. Lauda went into a coma in the hospital and a priest administered last rites. 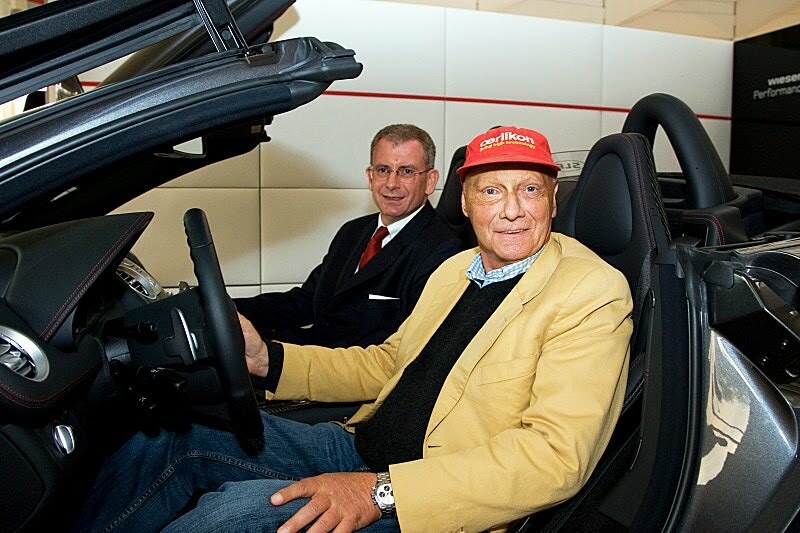 In what appeared to be nothing short of a miracle, Niki Lauda made it out of the coma and came back to life and even continued his racing career. Niki Lauda is pictured below checking out a Mercedes SLR Roadster and he is wearing his vintage Big Red Panda Rolex Daytona. In this next photo we see Niki Lauda sporting his Coke Rolex GMT-Master. 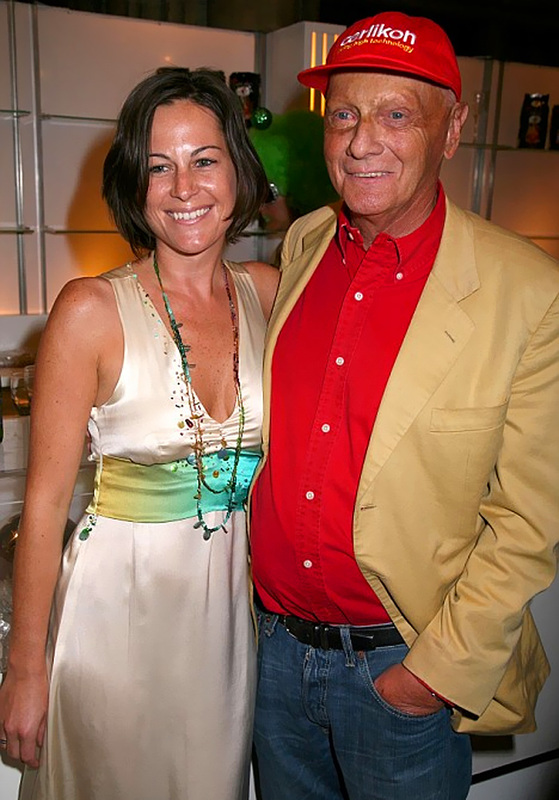 In 2008 Niki Lauda was 59 years old and married Birgit Wetzinger (pictured below) after a most unusual 4-year romance. 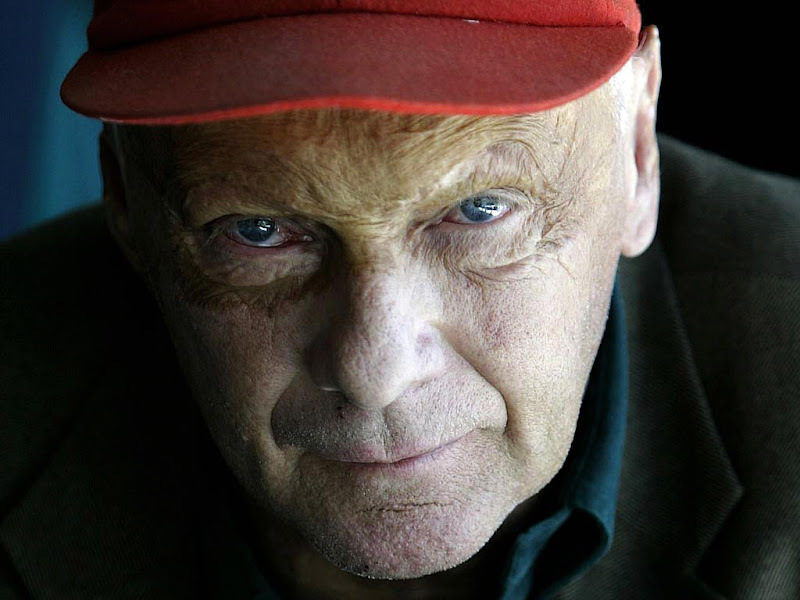 A year after Niki Lauda started dating Birgit, he was diagnosed with kidney failure, and his then girlfriend, Birgit successfully donated one of her kidneys which saved Niki Lauda's life. Leonardo Dicaprio and his supper-leggy-model girlfriend, Bar Refaeli both wear Rolex Daytona Cosmograph watches. 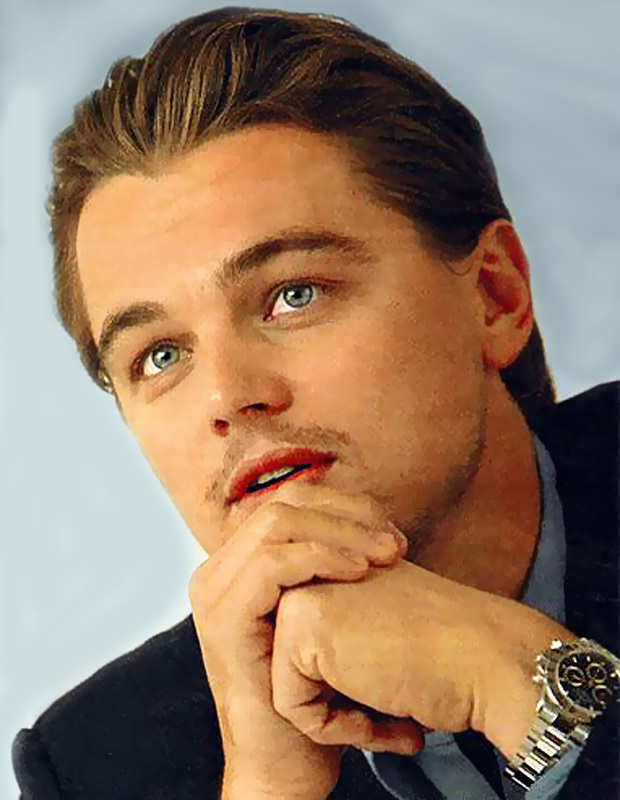 We see Bar Refaeli above sporting her two-tone Rolex Daytona and Leonardo Dicaptio (pictured below) sporting his stainless steel Rolex Daytona. 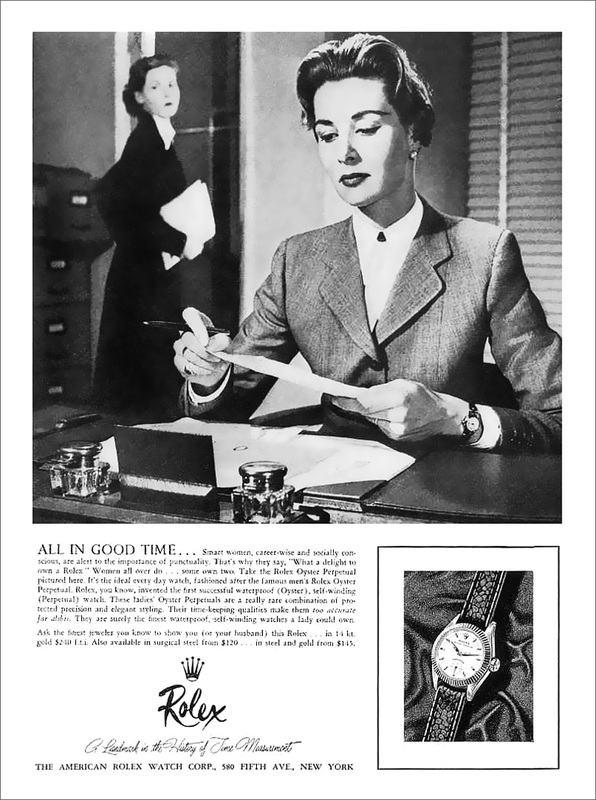 It is amazing when you study Rolex marketing history, how ahead of the curve Rolex always was, particularly with the ladies. 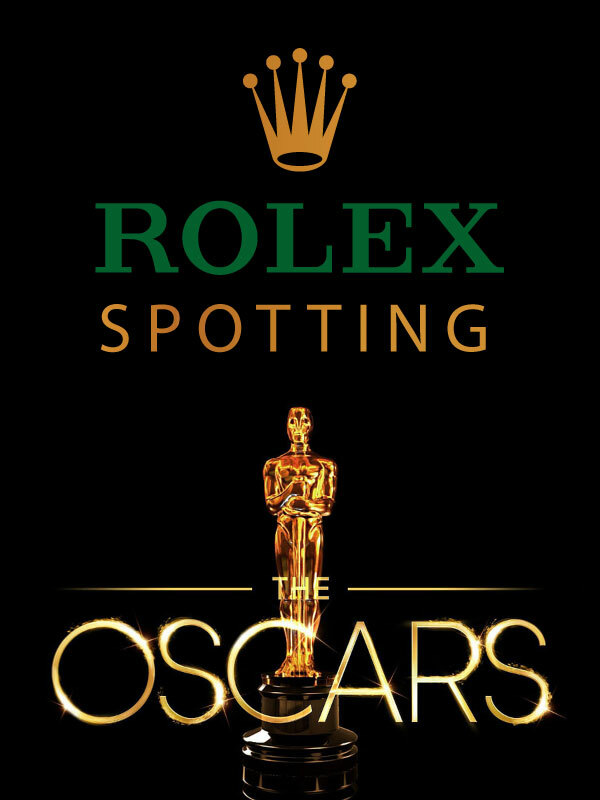 Once again, this supports my strong belief that Rolex, first and foremost, has always been about achievement. This company from Holland named U-Boat Worx sells personal DEEP SEA Submarines and this looks seriously fun, not to mention, Chris Rea singing "On The Beach," is great. For some reason, this video reminds me of Flipper. You gotta love summer!!! Everything considered classic today was once considered to be modern. This is definitely the case with the Gibson Les Paul as well as the Rolex Submariner 5513, and the one thing both have in common is their simple design language. 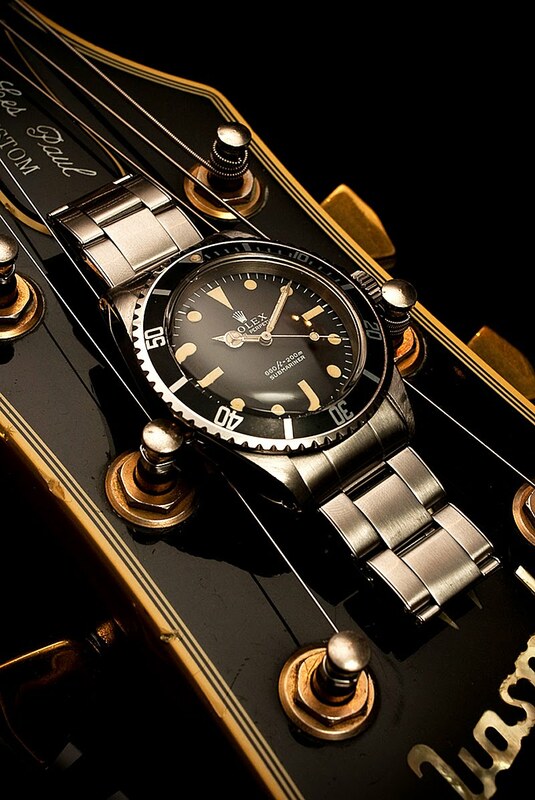 Vince took these superb shots that show his guitar and Submariner which both have a beautiful patina that can only come with age. 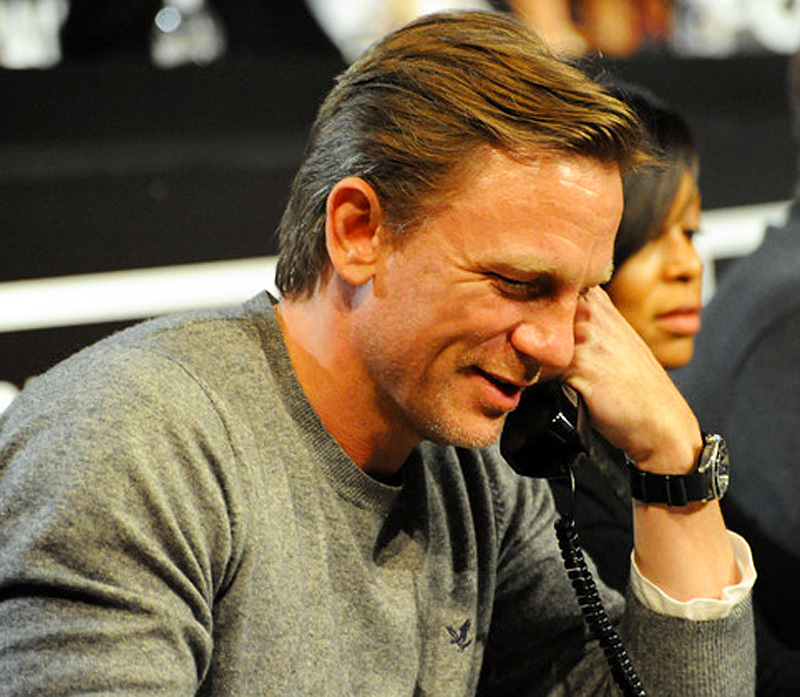 Daniel Craig is best known for playing James Bond. Daniel is also a big Rolex collector and in this photo below we see him sporting his customized PROJECT X DESIGNS PXD SS1 Limited Edition Rolex Submariner, as he talks on the phone for the Haitinow.Org telethon to help raise money to help rebuild Haiti on January 22, 2010 in Los Angeles, California. 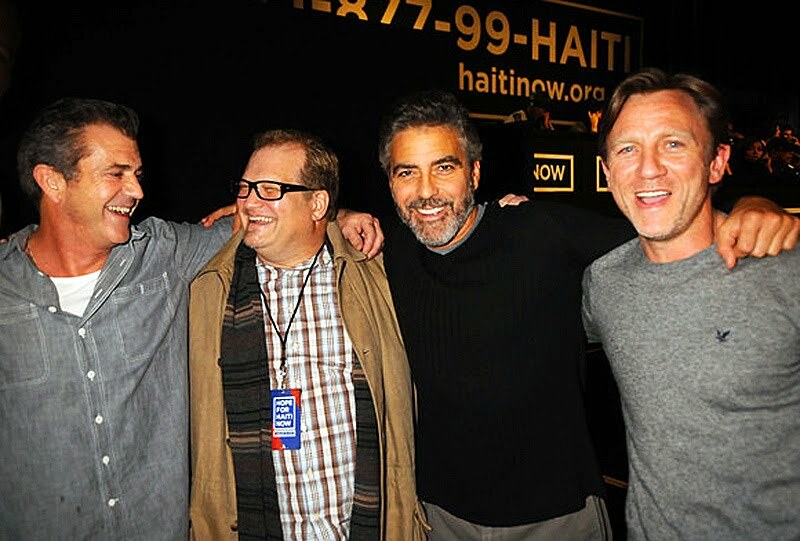 Daniel Craig is pictured below on the far right, next to George Clooney, Drew Cary and Mel Gibson on the far left. 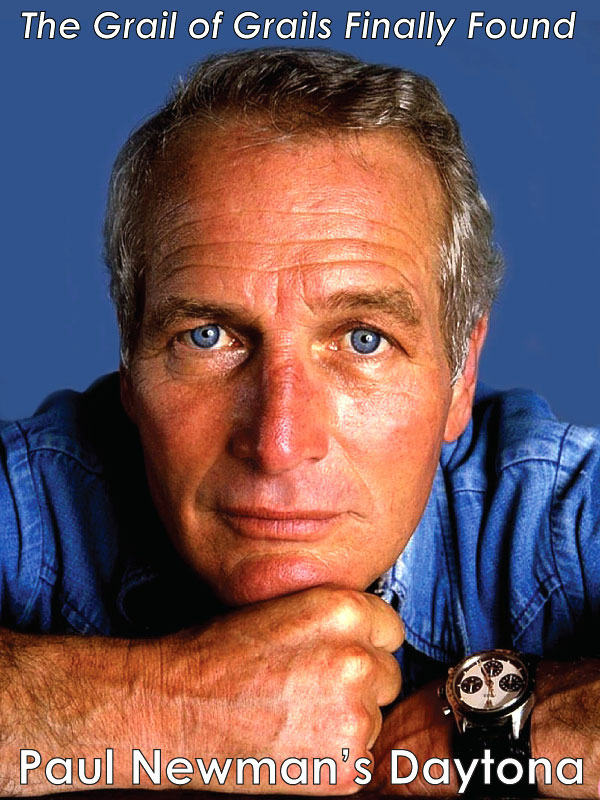 As I mentioned, Daniel Craig plays James Bond and if you want to learn everything about all the watches worn in all the James Bond movies you read The Complete History Of James Bond Watches, which covers Daniel Craig's obsession with Rolex. "Your blog just keeps getting better....I really like the articles on Daniel Craig...he seems like a "real man" something you don't see much of today...and he has great style...he took over from Steve McQueen...and bettered McQueen's style..."
I wrote back to Greg and mentioned that I totally agree that in many ways, Daniel Craig is the new King Of Cool–speaking of which, in the photo below we see Daniel Craig sporing the same model of Persol Sunglasses Steve McQueen wore!!! As I mentioned, in the top photo, Daniel Craig is wearing his PROJECT X DESIGNS Limited Edition SS1 LV Submariner which is pictured below. 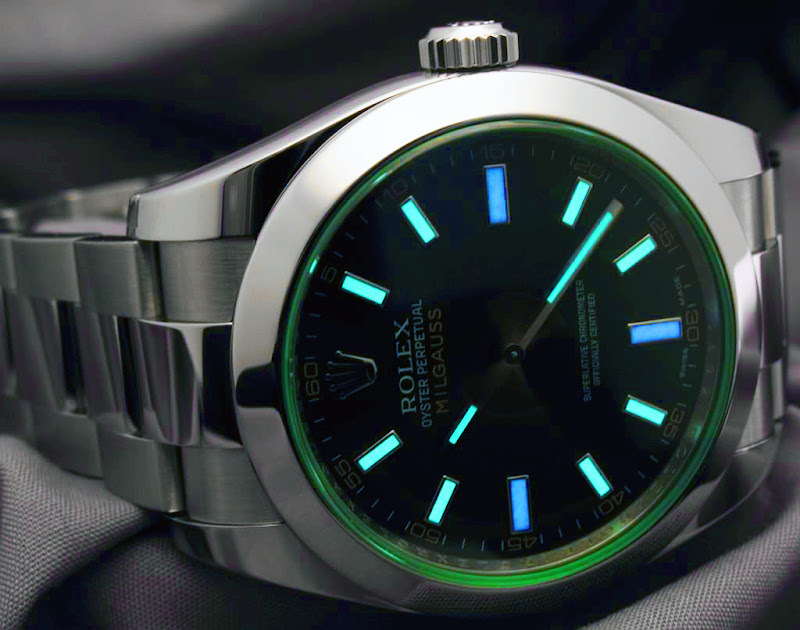 You can learn everything about PROJECT X DESIGNS which customizes Rolex watches and make stunning limited edition watches. I have personally reviewed all three of these books and discussed them in great detail with their authors, and highly recommend them for any Rolex enthusiast & collector. Leo and I agree that all three of these books are must have books to have in your Rolex book library. 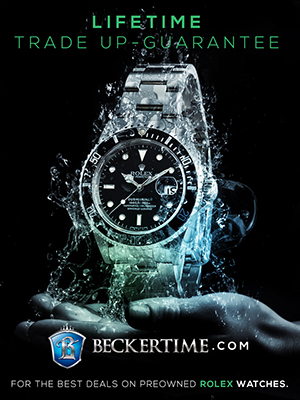 To read my review of The Best of Time, Rolex Wristwatches by James Dowling & Jeff Hess, as well as listen to the free podcast interview I recorded with co-author, Jeff Hess, please click here. 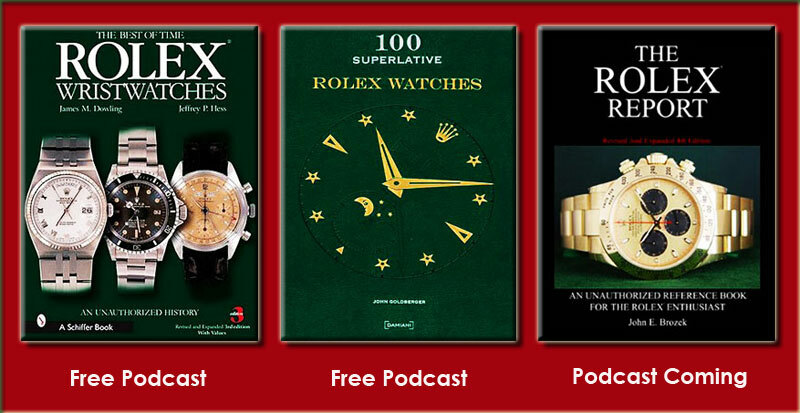 To read my review of 100 Superlative Rolex Watches as well as listen to my free podcast interview with the author, John Goldberger, please click here. 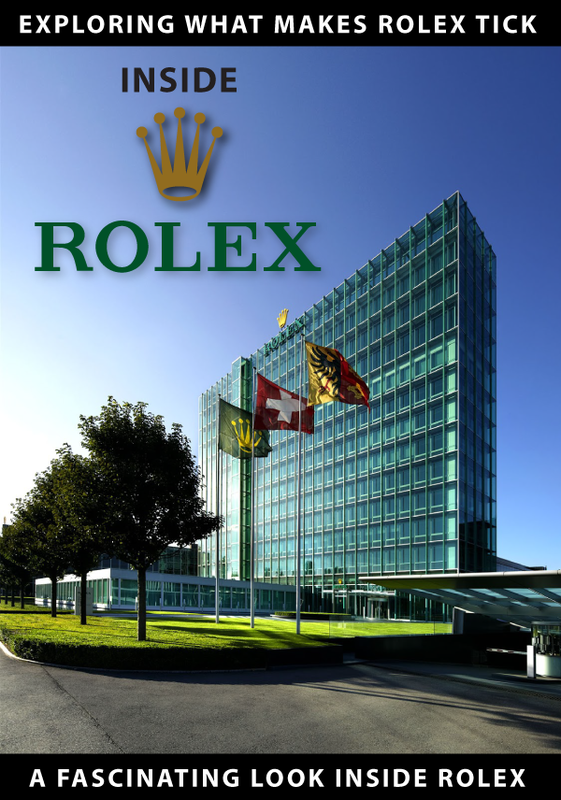 I am working on writing a review of The Rolex Report and should be recording a podcast with John Brozek sometime in the future. 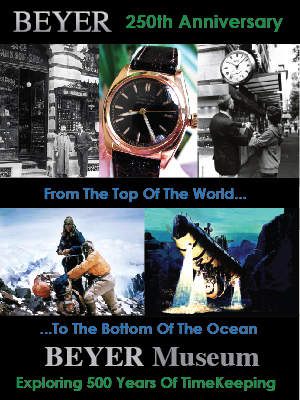 In the meantime I can share with you that this is a must have book for any Rolex enthusiast. By purchasing some of these great Rolex History books you can save up to 40% off of the retail price by purchasing them from Jake's Rolex Watch Blog. Purchasing the books here also helps you support Jake's Rolex Watch Blog.